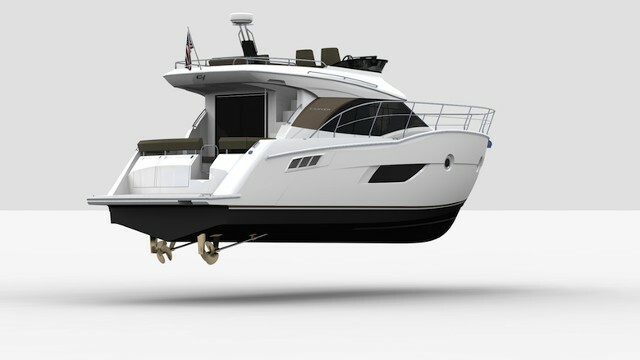 Carver continues to reinvent itself, now with its new C43 motor yacht. 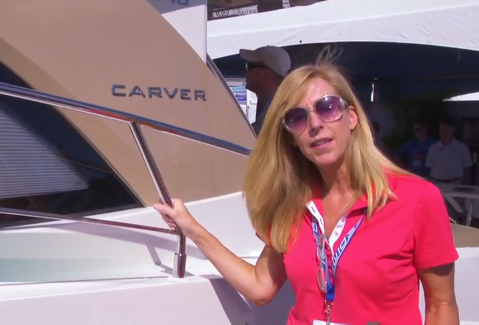 In case you haven’t noticed, motor yacht manufacturer Carver is on a roll. 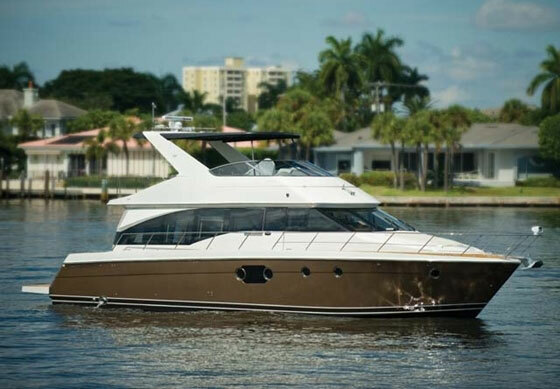 In 2013, the Wisconsin boatbuilder introduced the Carver C34, a totally new flybridge motoryacht that got a lot of “Ooohs” and “Aaaahs” at the 2013 Miami International Boat Show—thanks to its stunning new looks that were very, well, un-Carver-like. Within a year they introduced the C40 and a C37 Coupe, both based on the same spectacular lines of the C34, and this year they followed up with the C43—another stunner by all accounts. You look interested; we better make a closer examination of this new Carver offering. 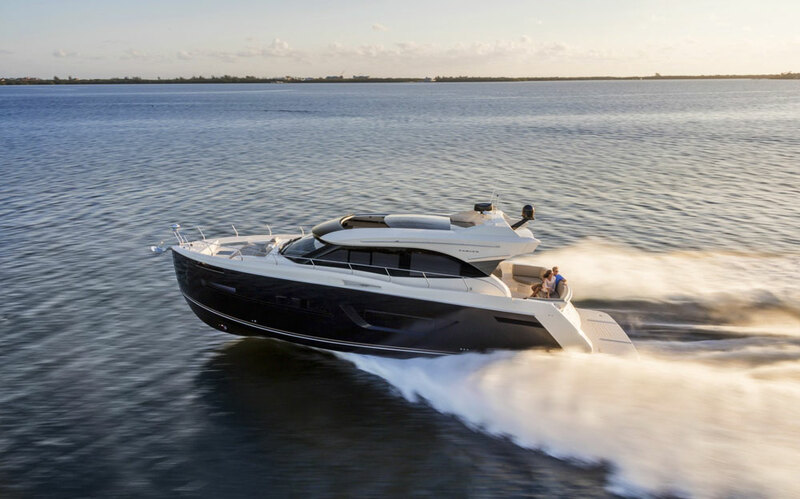 The Carver C43 joins a new line of great-looking motor yachts in the company's model lineup. One thing that struck me when I had the chance to pore over the brand-new C43 at this year’s Miami International Boat Show was how insanely good Carver’s lineup looks these days. And while Carvers have never been ugly by any means, this new design direction the company has taken is most refreshing. Like its siblings, the C43 has a sharp look, with a nearly plumb bow, forward-focused stance, and a stealthy low profile. Large wraparound cabin windows seem to pull that look together, while a slightly upward-angled cabin top accents that aforementioned forward stance. All in all, the C43 is definitely a looker. Carver’s boats have always maximized every inch of available space, and the C43 carries on that tradition in fine fashion. As a coupe, the focus on the outside spaces on the C43 is in the aft cockpit, which has a large, five-person L-shaped lounge set into the transom, with a smaller chaise lounge set off to starboard. An expansive teak table drops in ahead of the lounge and felt very sturdy and solid (many are not). Oh, and if it’s too sunny outside for comfortable happy-hour lounging, don’t worry. Simply press a button and an electric-powered retractable awning, which normally hides in the cabin top, spreads out over the aft cockpit. There's a ton of outside spaces on the Carver C43, but you'll have the most fun in the aft cockpit and on the huge swim platform. Water access from the cockpit is great, with a stainless-steel door that opens down to the large swim platform. There’s plenty of room to stow a dinghy, with the right gear. I sure would have loved to see teak or faux-teak decks in these outside spaces, but for the money you’ll save over comparable motor yachts in this category, perhaps it’s worth it. Something I really appreciated was the fact that the water fill, shore power inlets, and holding tank pumpout were all situated at the transom, within easy reach. Inside, the spaciousness continues in the main saloon, which is accessed through a set of folding glass doors that open wide to create a single outdoor/indoor living space. The galley is located aft, and I’ve got to tell you, it’s huge; it takes up almost the entire port side of the main saloon. That means tons of counter space for preparing meals and snacks, but I did feel as if there could have been more refrigerator space. Carver uses a low-boy refrigerator/freezer combo that just seems too small for a 43-footer that folks might use for cruising. 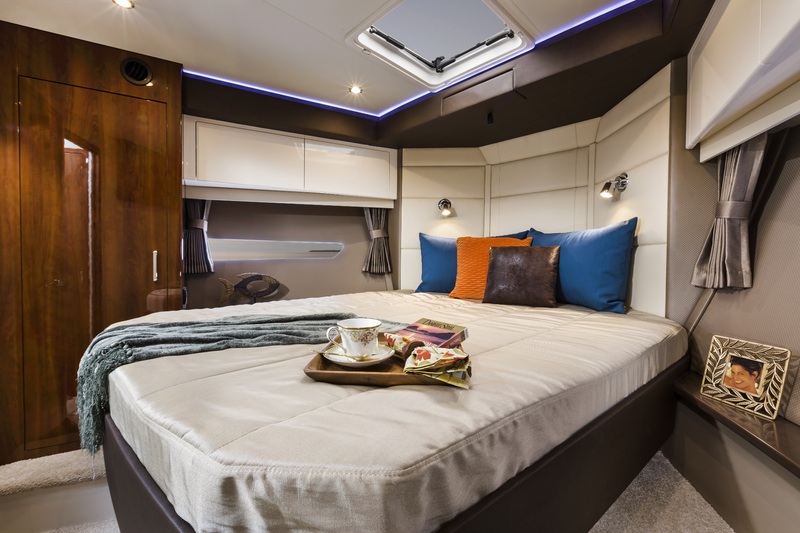 Carver has always had a knack for making the most out of every inch of space on its boats, and that skill is apparent in the C43's roomy main saloon. Note the overhead opening sunroof, covered by a sunshade in this photo. To starboard is a huge U-shaped dinette with a beautiful hi/lo teak table. 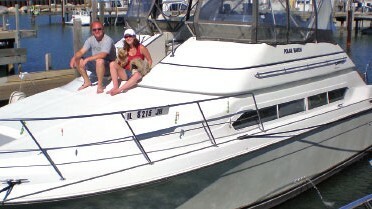 Up forward to starboard is the helm, which has comfy bench seating. It has good visibility both fore and aft, especially when the aft doors are folded wide open. There’s also plenty of room for electronic gizmos and goodies. To port ahead of the galley is an additional two-person bench. 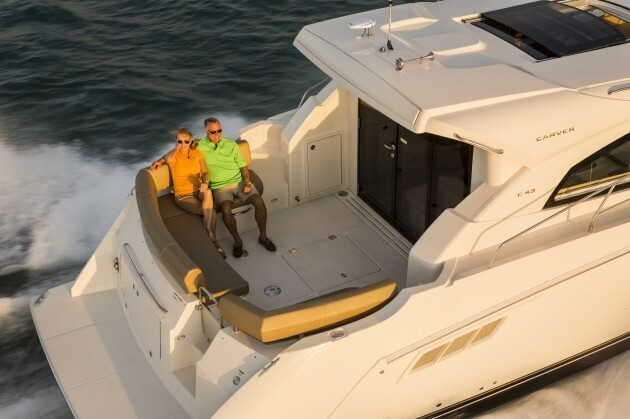 From the “Wow, that’s clever” file is the opening power sunroof that lets the sun and sea breeze flow right into the main saloon, providing an unlimited ceiling. 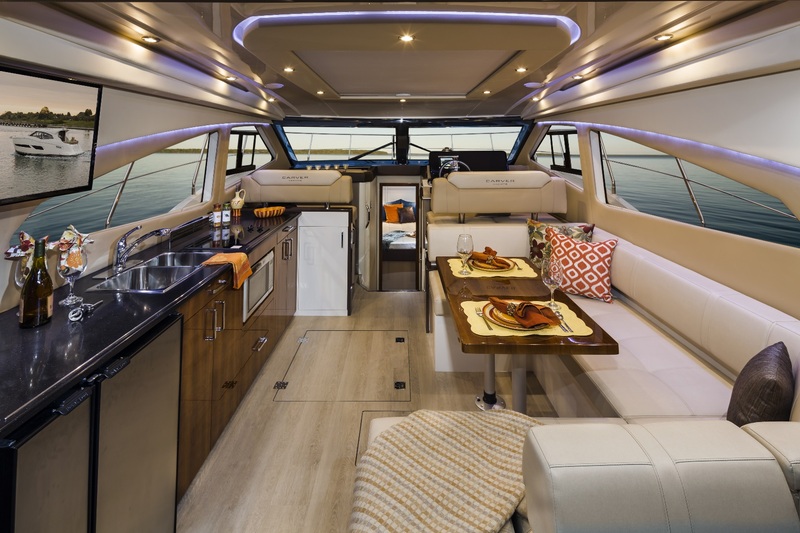 And this is one of the great benefits of a coupe design—without a flybridge to get in the way, the sky is no longer the limit, at least when it comes to opening up the inside spaces of a boat. Take three steps down from the main saloon and you’ll find yourself in a landing that provides access to the master stateroom, guest cabin, and a shared day-head. An island berth that’s set into the bow with easy access on either side highlights the master stateroom. Full-length window panels in the hullsides let the light shine in, and provide a connection with the water. Two big, separate hanging lockers are a nice touch, as is the completely private head and shower, which has a totally enclosed shower stall with glass door, a huge washbasin, and more stowage than I’ve seen in heads on much bigger boats. It’s extremely well-appointed and the varnished wood cabinets and smart bulkhead color choices give it a rich feel. The island berth in the extremely roomy master stateroom. The guest stateroom can be configured with twin beds, or as a full-size sleeping area by simply dropping in a filler cushion. There’s a bit of a height limitation here, because a portion of it is situated under the main saloon, but the headroom is actually pretty generous, overall. There’s a guest entrance to the day-head from this cabin, as well as the one from the central landing area. Got extra guests aboard? No problem, you can also drop the dinette table in the main saloon to form a large berth. Standard power on the Carver C43 is a pair of Cummins 6.7-liter, 380-horsepower diesels very nicely snuggled into an engine room that had good access for daily checks and routine maintenance. A pair of Cummins 6.7-liter, 480-horsepower diesels are an option. 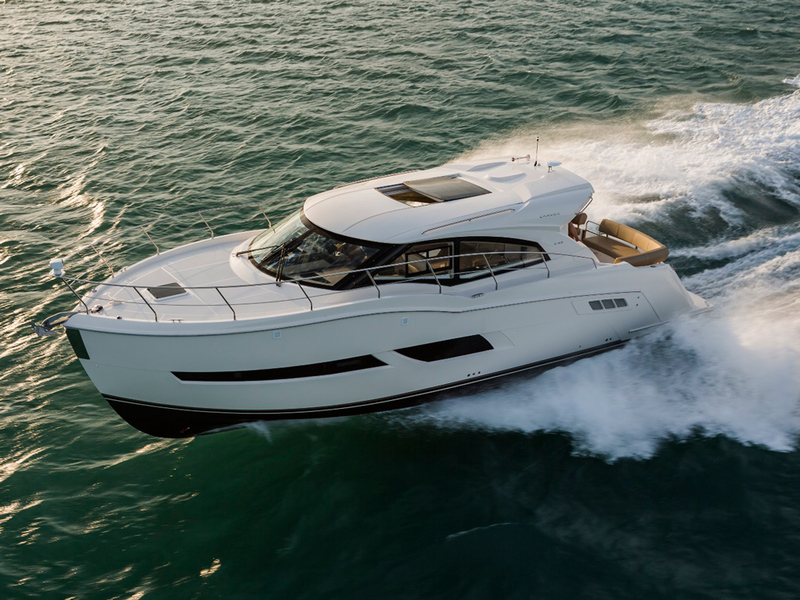 Performance numbers and fuel burn figures are not yet available, but the standard diesels should prove to be spunky and efficient, given this boat’s underwater characteristics and displacement. Joystick steering is available as an option that integrates the bow thruster and shaft-driven, 22-inch, four-bladed props. Fuel capacity is 350 gallons via twin 175-gallon aluminum tanks. I’m definitely looking forward to taking the C43 for a whirl on the water in the near future. If her performance on dry land is any indication of how good this boat is at sea, prospective owners are definitely in for a treat. 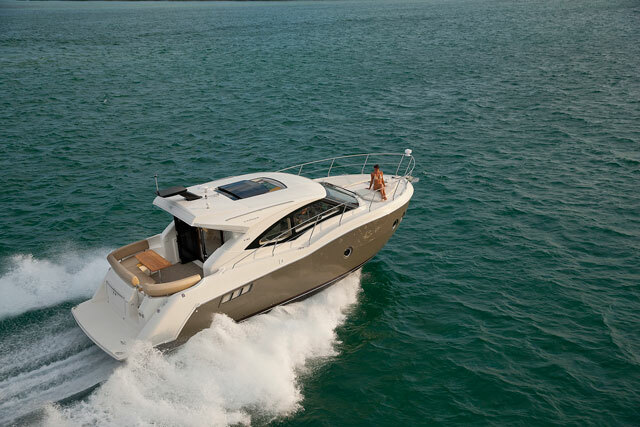 Other Choices: Some other boats you'll want to look at in this size range and category include the Tiara 44 Coupe and the Four Winns H440. View Carver motor yacht listings. 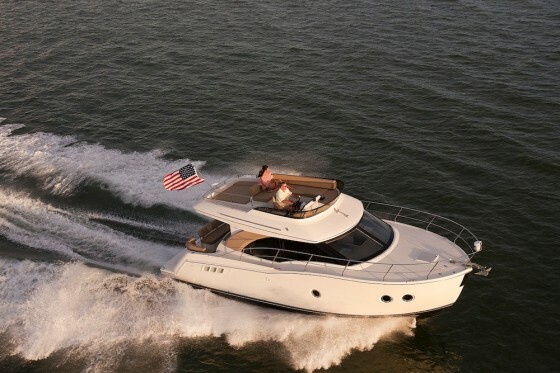 For more information, visit Carver Yachts.